: Hunting dog. Companion dog, family dog, suitable to be trained for various purposes. : Christina Bailey / Original version (DE). : The origin of the Dalmatian dog can be recognized in paintings and in church chronicles from the 16th to the 18th century. Dalmatians can be found on the altar painting “Madonna with Jesus and Angels” in the church “Gospa od andjela” in the town Veli Losinj, island Losinj in Croatia dating back to 1600 – 1630 and also in a fresco in Zaostrog, Dalmatia, Croatia. It suggests that the Dalmatian originates from the eastern Mediterranean region, in particular the historic province Dalmatia. : Mesocephalic. Head prismatic form with hanging ears. The body is rectangular, strong, muscled and distinctively spotted. The movement must be elegant. The sexual difference must be visible. : Length of the body height at the withers = 10 9. The height at the elbow joint 50% of the height at the withers. The height the hocks 20-25% of the height at the withers. Length of head around 40% of the height at the withers. Length of skull length of muzzle = 1 1.
: Pleasant temperament, friendly, not shy or hesitant, free from nervousness and aggression. Lively kind, loyal, independent and easy to train. The Dalmatian likes water and outdoor activities. It has a marked hound instinct. : The head must be in proportion and harmony with the rest of the body and not too wide in the skull area. The length from the occipital protuberance to the stop and from the stop to the tip of the nose equals 11, or the muzzle is slightly shorter. The upper line of the skull and the upper line of the muzzle are slightly divergent. The masseter muscle and the cheek bone must not be too developed. The head must be entirely free from wrinkle. : Flat, with a slight lateral rounding. Broadest between the ears and well defined temples. Slight frontal furrow. : Large with wide open nostrils, it must be completely pigmented. The colour must be in accordance to the colour of the spotting. : Well developed & strong jawbone, nasal bridge straight. : Strong, must fit the jaw rather closely and not be pendulous, or too thick; without the corner of the mouth too defined. A complete pigmentation is desired. : Scissor bite, i.e. the upper 6 incisors closely overlapping the lower teeth, with all teeth set square to the jaw. A complete set of teeth (42 teeth) is desired (in accordance with the teeth formula). The teeth are evenly formed and white. A pincer bite is tolerated in older dogs. : Oval, in a sub-frontal position placed at an angle of 10-15°. The eye colour is in accordance with the spotting. Eyelids are close to the eyeball and not loose. Eye rims are completely pigmented in accordance with the coat colour. : Set on rather high, carried close to the lateral part of the head. The length reaches to the inner corner of the eye or to the stop. The tip is slightly rounded. The ears have the shape of an isosceles triangle. They are fine in texture and soft to the touch. It is very important that the ears are spotted, i.e. the ears must not be completely black or brown but black or brown spotted etc. with the spotting in accordance with the colour variety on the white base. : The neck should be strong and fairly long, tapering towards the head and free from throatiness. : Rectangular, proportions of length of body to the height at the withers is 10 9.
: Muscular, inclined less than 30°. : Deep and capacious, not too broad or barrel-shaped. The depth of the chest should be 45-50% of the height to the withers. The height of the elbow is 50% of the height to the withers. The ribs are well sprung. : The belly is moderately tucked up but not drawn in. : Set on at the extension of the croup. Reaching approximately to the hock or slightly longer. Strong at the base evenly tapering towards the tip, not too thick but in proportion to the body. Carried sabre-shaped. Preferably spotted. : The forelegs must be in proportion to the rectangular body. : The bones are developed in proportion to the body and strong (round), forequarters placed straight and legs standing vertical. : Strong, slightly sloping with a spring. : Forefeet The toes are compact, so called cat feet are typical. Pads are tough and elastic. The nails should preferably be pigmented. : The toes are compact, so called cat feet are typical. Pads are tough and elastic. The nails should preferably be pigmented. : In proportion to the body. With strong well developed muscles. Hindlegs are parallel. : Strong and well developed. The stifle has an angle of 40 degree to the horizontal line. : The length of the hocks is around 20-25% of the height to the withers. The angle of the hock is around 130°. : Rhythmic action, elegant and smooth movement. Stride and trot long with good reach and strong drive. Viewed from the front the legs are parallel. : Short, shiny, hard and dense all over the body. : The ground colour is pure white. Black spotted variety with black spots, liver spotted variety with brown spots. 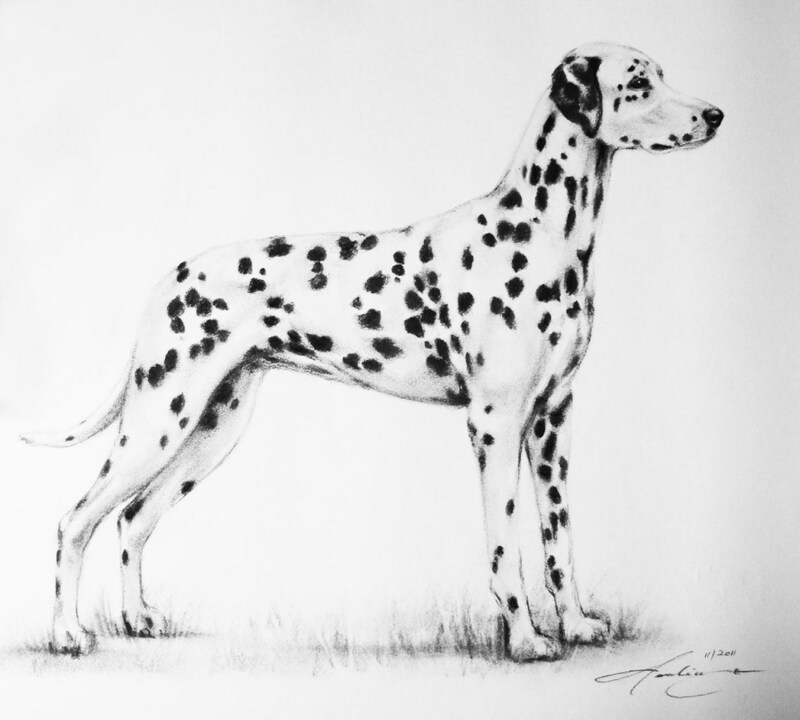 The spots should be symmetrically placed all over the body, clearly defined and without intermingling into the white ground colour. The size of the spots should preferably be even, with a size of 2 – 3 cm in diameter. In the brown variety the spots are a little smaller, around 2 cm. The spots on the head and on the legs should be proportional smaller than on the rest of the body. It is desirable the tail is spotted too, with spots also proportional smaller that those on the body. Splashes on the body are not desirable and should be penalised. The spots must not intermingle, i.e. forming large patches. Patches and coloured areas are not desirable. The spots on the ears should be especially noted. Males 56 – 62 cms. Females 54 – 60 cms. eyes, partially blue coloured iris.